Dry roast 1 tsp cumin seeds, 1 tsp fennel seeds, 1/4 tsp nigella seeds, 1 tsp fenugreek seeds, a small piece of cinnamon & cardamon. Grind the above dry roasted ingredients to a coarse powder and keep aside. Wash and peel the raw mangoes. Cut the mangoes lengthwise(vertically) in strips or in chunks, as per your preference. Heat oil in a pan, add mustard seeds, 1 tsp fennel seeds, a small piece of cinnamon & dry red chillies. 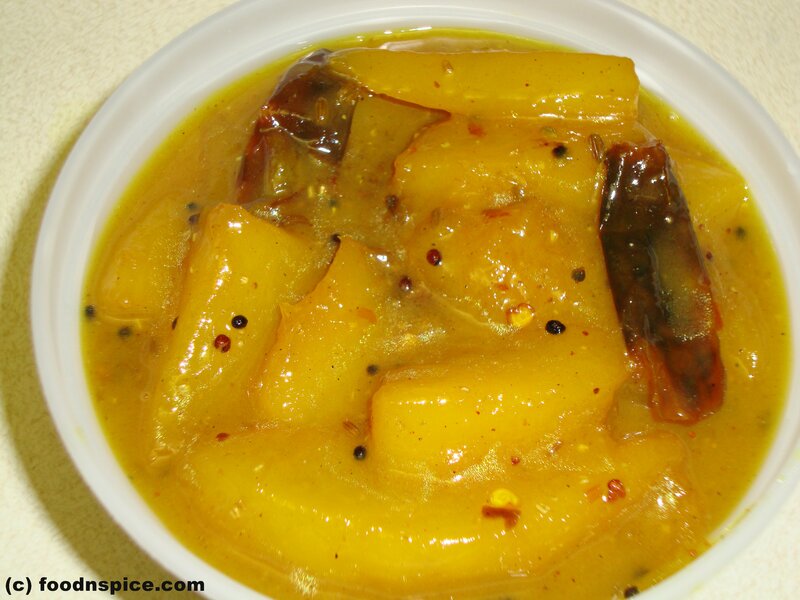 As the mustard seeds start crackling, add the green mango pieces and saute for few minutes on low heat. Add salt, turmeric powder and stir. Add 2 tbspn water. Cover and cook for 5 minutes. Check if the mangoes are cooked. Add crushed jaggery and cover and simmer till the jaggery has dissolved and you get a thick consistency. Remove from heat and add 2 tsp of the above ground masala to the chutney and mix. Serve hot or cold. This chutney can be stored refrigerated for up to 4 days.